Every student and every teacher is a member of one of four ‘houses’. 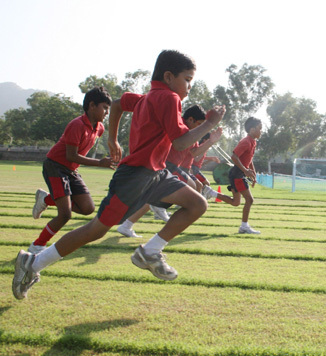 Our house system promotes team building and social skills by fostering healthy student engagement through a wide variety of inter-house competitions. Points garnered through the year at a multitude of activities count towards the award of annual trophies for excellence in academics, sports, and co-curricular activities, both at the individual and team level. The four houses are led by respective House In-charge who motivate student members towards inculcating the spirit of healthy competition. An able, creative and efficient House In-charge facilitates the development of team spirit among students, builds their confidence and ushers the house towards a leading position in various competitions. Working under overall guidance of the Principal to ensure smooth management of the house and maintenance of House discipline. Motivating all the student members of the house to participate in inter-house co-curricular events and other activities. Delegating duties to House tutors for grooming and ably managing the various teams for Inter House activities. Working ceaselessly with the House tutors towards bringing the best out of the students. Appointing the House Captains (a boy and a girl). Guiding the captain of the activity for selection of suitable students for making teams. Suggesting names of prospective candidates for Prefectship. Carrying out all other duties assigned by the Principal. The appointment of a boy and a girl House Captain is done by the House In-charge. For activities conducted during January to March, competent students of Grade XI are appointed as House Captains. For all the Inter House CCA and Sports activities conducted during rest of the year, the Captains are appointed from Grade XII. Demonstrating team spirit while working with other members of the house. Encouraging fellow students to participate in house activities and competitions. Sustaining the spirit of the House and bidding fellow students to maintain discipline during House activity. Seeking guidance from the House In-charge and reporting to him/her. Performing the duties with a non-discriminatory and non-partisan approach. Assisting House In-charge in selecting talented students to represent the House in competitions. Carrying out all other duties assigned by the House In-charge. The House Tutors are appointed by respective House In-charges to oversee the smooth running of after-school practice sessions for CCA.